"Munin" means "memory".Munin the tool surveys all your computers and remembers what it saw. It presents all the information in in graphs through a web interface. Its emphasis is on plug and play capabilities. 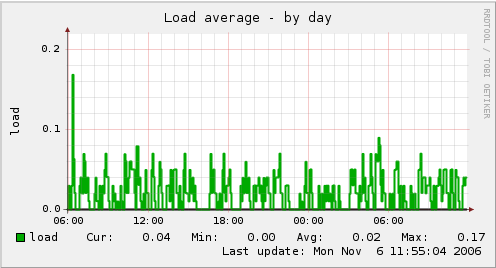 After completing a installation a high number of monitoring plugins will be playing with no more effort. Using Munin you can easily monitor the performance of your computers, networks, SANs, and quite possibly applications as well. It makes it easy to determine "what's different today" when a performance problem crops up. It makes it easy to see how you're doing capacity wise on all limited resources. munin-node (munin Client) -- the munin client program. If you want to configure munin server you need to edit the /etc/munin/munin.conf file.The sample file looks like below. # must be writable by the user running munin-cron. # the services must be defined in the Nagios server as well. This will install munin node package and it will create a folder called /etc/munin. # This file is used to configure how the plugins are invoked. # user # Set the user to run the plugin as. # group # Set the group to run the plugin as. # what would normally be run. Now look in to plugins/ directory it is a directory in which each file is a symlink to a real plugin in /usr/share/munin/plugins.Any plugin linked in here will be checked for and displayed in the resulting web pages.Add the plugins you want (e.g. if running exim4 then I'd add postfix_queue and postfix_stats).You'll need to set user/group rights in the munin-node conf file. Most plugins can be run from the command line with the autoconf param to check if they can run -- e.g. After entering all the client machine details you need to the following command to take the effect of our new changes effect. Keeping an eye on these graphs will help you to keep your servers running healthily -- and can give advance warning of problems to come. munin-node.log -- should show the connections that are occuring. 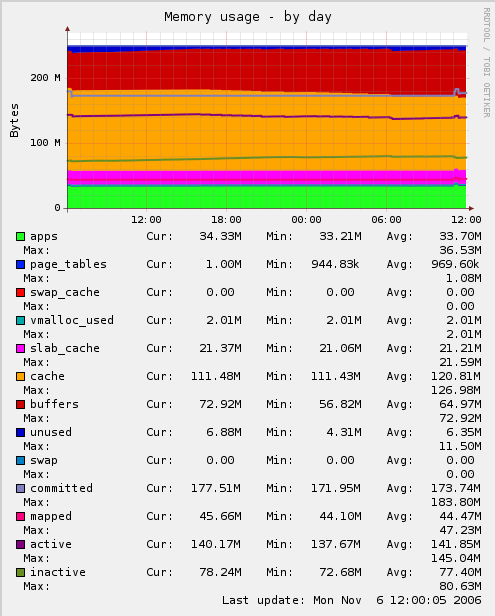 munin-graph.log -- should show info on the services being graphed. munin-html.log -- should show info on the html being generated. Does anyone know a link to phase 2? 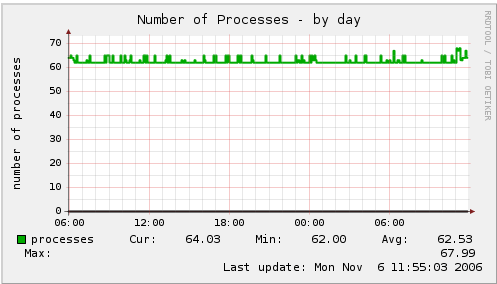 After installing Munin – there’s good tutes like this one everywhere – WHAT DO THE NUMBERS MEAN? 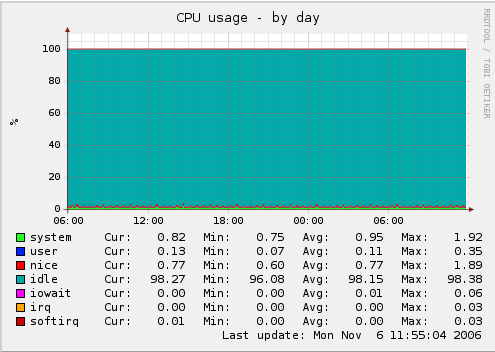 I’ve been using munin on a few systems, but only look at the graphs I care about – mysql queries, cpu usage. 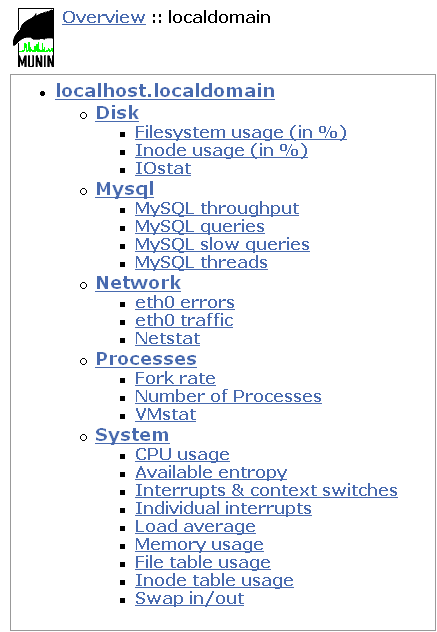 Now I’m seeing a (simple webserver) system where ‘inode table usage’ and ‘memory usage’ are all squiggly. I don’t even know if I should care. I’ve been searching for a page on analyzing munin output and optimizing the system based on that. Any ideas? can anyone tell me where to install munin server and where to install munin client? install munin server (master) on the computer you want to host the web pages. Install munin-node (client) on the computers you want to be monitored. The clients will pass the data to the master and compile the graphs and data for web pages to publish.